Maintaining water security requires complex decisions to be made within a complex operating environment. 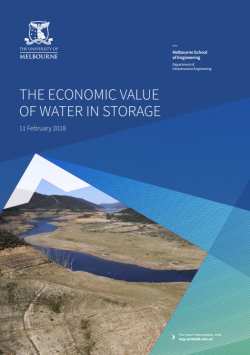 The Economic Value of Water in Storage report, developed by the University of Melbourne, estimates how different ways of operating the system affect the expected cost of maintaining water security at different levels for Melbourne over the next 20 years. the benefits of forward planning of future augmentations. Traditionally, the costs taken into account for decision making included the engineering costs associated with augmenting the system (sources and / or grid infrastructure) based on typical streamflow conditions, the costs of making desalinated water orders and system pumping costs. This report, and the models it has developed, also include the costs to society of not being able to supply water to meet demands, the opportunity costs associated with water trading, and the impact of variations in the timing of augmentations related to variations in water availability.